Denim never goes out of fashion. But the ‘in’ style or fit changes every season or so. On the one hand, this may not be good news… if the latest designs and styles don’t suit your personal taste or your body type. On the other hand, it’s great news… because it means you get to try a whole new selection of jeans with different cuts and styles than you’ve tried before. Chances are, you’ve only found a few pairs of jeans that you think suit your body well — so you keep buying the same brand, size, and style year after year. Well, it’s time to step outside of your comfort zone and try on some new brands and styles for a change. Think beyond your conservative style and have some fun exploring all that denim has to offer these days. As much as you might be inclined to try on a particular style because that’s what looks great on others, stick to jeans that flatter your body — not someone else’s. There aren’t many styles of jeans that look great on every body in every situation. 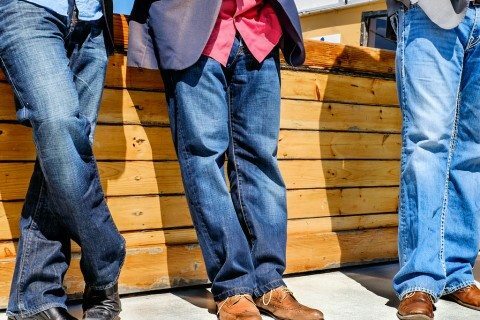 While you might like skinny jeans, if you’re carrying around a few extra lb’s right now, this style of denim is going to look ridiculous on you. It’s much easier to give in to your physique, and go for the jeans that work with your body. Or, if you’ve been hitting the gym pretty hard, then you may find that skinny jeans make you look really top-heavy. Heck, you might not even find a pair that you can squeeze your legs into. Work with the cut that fits you best, and abandon any styles that just don’t fit well. Cheap denim usually looks… cheap. It rarely looks good on any body type. Don’t let the advertisements in the discount stores fool you, because you’re just not going to look as cool as the model in a pair of $20 jeans. Top-end labels and designer brands pay a lot more attention to a man’s body shape. They don’t design for Mr. Average. So you’re more likely to find jeans that fit really well and last for ages when you buy better brands. Some brands — like Diesel and Replay — are also more likely to try daring styles. So you’ll get a pair of jeans that stands out in a crowd of “average” guys wearing “average” jeans. Many guys think they can buy clothes without trying them on first. Wrong! You just cannot predict what a pair of jeans is going to look like — and how it’s going to fit — so you must have a look in the mirror before you part with your cash. Some design for men with a smaller physique; others design for men with a larger physique. Some limit their sizes to smaller numbers; others focus on larger sizes. The bottom line: if you try on a certain size in one brand of jeans, chances are the exact same size won’t fit the same way in another brand of jeans — so always try them on first. After you find the jeans you like and that fit you well, then you can feel comfortable buying future pairs online. Finding a good pair of jeans takes time. Your best bet is to put aside an entire afternoon for your denim shopping. And take your wife or girlfriend with you. If you both approve of a particular pair of jeans, then you’ve got a winner. There’s a brand of jeans out there for everybody. It’s all a matter of personal taste, but the important thing is to spend some time getting to know the brands… so you know who designs for your body type and your sense of style. Once you find your ideal label(s), you won’t be wasting time on jeans that aren’t going to fit you — now and in the future. There are lots of different types of jeans available in stores and online. But many guys simply don’t know how to buy denim. The goal here is to help you spend your time and money wisely — because your jeans can make or break any outfit. It’s definitely worth your time to get it right. In the end, you’re probably going to want 3 or 4 different pairs of jeans in your closet. You can’t survive for long with just one pair of jeans in your life.